Destiny 2 has attracted legions of dedicated fans and has been enjoyed by millions of gamers around the world since launching in 2017. Now, that fanbase is set to grow as new Guardians will be able to enter the world of Destiny 2 for free in November. 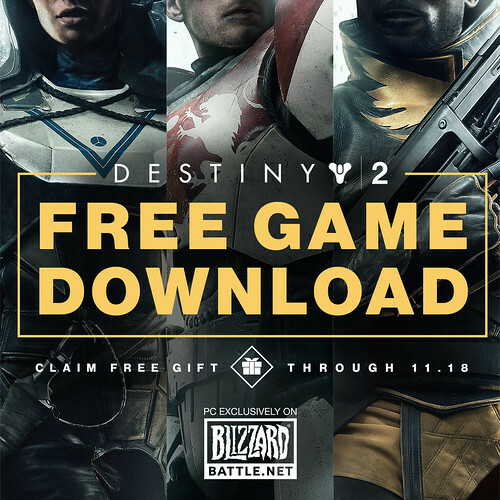 To celebrate an entire year on PC, Bungie and Activision, in collaboration with Blizzard Entertainment, announce that from November 2nd to November 18th everyone on Blizzard’s Battle.net gaming platform who has not already purchased Destiny 2—or any new members joining Battle.net—will have the opportunity to claim the game as a free gift. Destiny 2 will be available on the Battle.net app to claim for free for a little more than two weeks in November, and players will have the opportunity to download the game once they’ve claimed it. New Battle.net accounts created after 19:00 BST on November 2, 2018, will be required to enable Blizzard SMS Protect before claiming their game license. Destiny 2 is redeemable from account.blizzard.com/gifts. Existing players of Destiny 2 PC will receive an exclusive emblem not available anywhere else, which becomes available in December, to commemorate the first anniversary of being on Battle.net. Additionally, new Guardians will have the opportunity to try out Destiny 2: Forsaken’s new mode “Gambit,” from November 9th through 11th 2018, during the Gambit Free Weekend. Gambit is a 4v4 hybrid activity included with Destiny 2: Forsaken. More details are available at DestinyTheGame.com/Battlenet. For more game information, visit DestinyTheGame.com. Fantastic deal. Jump on this if you have the Blizzard launcher installed. It's a great game with all the expansions. I still play now and then. Despite RocketLeague having a strong strong hold on my nuts, Destiny 2 is my favorite game atm. You don't even have to have the launcher installed. If you have a Blizzard account (is it still Battle.net?) just log into the web site and find the Gifts option in your account and accept it. You don't have to install anything until you want to. As I was getting this added to my account, I also preordered the Warcraft 3 remaster because I'm a sucker. I have, however, been wanting to replay the campaign...so, I suppose it's not a complete waste. This game was on sale recently for $4 (base game). I bought 4 copies and gave some to friends. It took me 2 days of playing to buy all the expansion content. Certainly enjoying it myself. Osiris was not a great expansion, but Forsaken is worth the price in my opinion. Just started running the new raid with my clan last night (blind) and having a blast. Going to see if we can finish it up tonight. This presumes you get the expansions, because holy hell is the base game boring.